If you’re looking to start a new blog in 2019, I’ve a quick tip for you. Don’t launch it until you’ve a SEO checklist. Why? The reason is simple: with an SEO checklist, you can boost your search rankings really quickly even if you’ve a new website. This SEO checklist contain 10 major things that I always follow while launching a new blog for better SEO so it comes in handy for you too. This basic SEO checklist for new websites can help you when launching your latest blog irrespective of the niche you have chosen. So let’s jump into the details with further ado. These 3 things play a crucial role in increasing your on-page optimization and helps you bring more traffic from search engines to the keywords that you want to rank for. Quick tip: You can use Yoast SEO plugin for better optimization of your posts. You can make changes to both title, meta description and tags using this plugin. Title tag (h1 tag) is the most important ranking factor. Always make sure to create a unique title tag that’s not been used anywhere else (you can use Google search before to make sure you’re using a unique title). Have you included your primary keyword in your title? is it helpful to your readers? Your meta description is what pops up when someone searches for a term in Google search (along with the title). So make sure to include it in every post. Is it under 140 characters? Just like H1 tag, H2 and H3 tags are crucial while optimizing your content. They can also serve you as sub headings to give better experience to your readers while skimming through your posts. Included at least one h2 tag with your primary keyword? Included at least 2 to 3 h3 tags within your content? Internal links can help you with better crawling rates from search engines. The more you link to your inner posts whenever you publish or update content, the better it is for your search rankings. Most bloggers don’t realise the importance of linking to external and relevant sites from their content. But it’s also one of the ranking factors when you’re linking to relevant and authority sites. Did you link to relevant pages from other sites? Did you link to authoritative sites within your niche for better rankings? Now, let’s discuss about the SEO checklist for images. Using at least one image for every blog post you publish can do wonders and bring you a ton of visitors because people also use Google image search to find their favorite content. Make sure to give credit if you’re using others images. I recommend you to use free copyright images if possible. Are you using at least one image per post? We’ll now talk about the URL structure in this SEO checklist as URL plays a vital role in both search results and social media sharing. URL structure plays a vital role in your search engine rankings. So truncate your URL structure for better search engine visibility for your keywords that you want to rank for. Also use short and sweet URL’s for best user and search experience. Is your URL short and sweet? Does it include your primary keyword? Without keywords, you can’t rank higher in search results. It’s essential for everyone to do keyword research before they even begin writing their posts. Try to use as many long tail keywords as possible if you want to get more rankings because they contribute to 70% of search traffic. Are you using your primary keyword within your title, alt tags, h2, h3 tags etc? Are you using LSI relevant keywords for your primary keyword? Go to Pingdom tools to find out your site loading time. If it’s taking more than 3 seconds to load, use these tips to speed up your site. The social shares you get, the comments your content gets, every user engagement counts in getting better search rankings. Are you using social sharing buttons to let your audience easily share your blog posts? Are you using CTA (call to action like asking for comments or shares) at the end of content? Are you replying to your comments? Here are a few important things that you must keep in mind while using the SEO checklist for new websites in 2019 to get better search rankings. To a normal user, the 2 addresses http://www.example.com and http://example.com might appear same, but to Google, these two are completely different. You may say that both correspond to the same page, and in fact they do, but it is always recommended either of the two versions on the complete site for better SEO. You may either use the link “www” or “non-www” while using the linking tags throughout your site. In case there’s a mismatch, Google would have to automatically discard any one of them leading to poor optimization. To solve the issue, select any one of them, and then redirect all the pages of the second version to the primary version. So the action element here for you is to do the SEO friendly (301) redirection of one version to the preferred version. Did you ever think of that extra ‘s’ in https? Well, it stands for SSL (Secure Sockets Layer). Hackers can’t intercept any of your data as it encrypts your connection to a website. Here are the few reasons why you should enable https on your website immediately. Let’s say two websites are competing for same position for one particular user query then there is a tie. In that case, Google prefers the one that has https enabled. In order to provide better experience, Google makes frequent changes to its algorithm. If your website accepts credit cards or has a login functionality, then your website must have https. You should instill trust in users mind that you are making an effort to protect them from their private information being compromised. If you want certain pages load almost instantaneously on mobile, then those pages should be AMP-ready and for AMP( Accelerated Mobile Pages. ), SSL is very important. Google is going to start indexing mobile so https is preferred over http in index. If http ‘s’ is not there on your website then the update chrome 56 will start displaying not secure in the browser bar and when it shows that to user, no one will dare to enter your website and compromise their private information. So, move to https today itself. If you don’t want to lose your revenues and if you want your SEO to be strong then enable https on your website. Google analytics is a great tool to keep a check on your site’s stats. It makes vital information like how many visitors viewed your site in the past, how many active users are on the site currently, what is the bounce rate for your site, how many visits were through organic search and how many were direct or through Facebook, etc. If you already have a Google account, setting up Analytics would be a matter of seconds. Google Analytics provides basic info about your site, but if you need some deep info like what pages are being indexed, how is your site responding, what are the errors and warnings from Google’s point of view, is your site suffering from any kind of bugs or shortcomings, etc. These webmaster tools also allow you to contact the search engine support team directly in case you think that you being penalized. It’s a good idea to set up accounts on Google Webmaster Tools and Bing Webmaster Tools. Once you have prepared your analytics and webmaster tools account, you can further proceed to connect both of them which would help you to get the complete information from once dashboard itself. You should check this guide from Google in case you don’t know how to link your GWT account with Google Analytics account. Robots.txt file contains information on which pages of your site must be crawled by the search engine bots, and which should be neglected. In case some of your pages have similar type of content, it is always recommended to use a robots.txt file or else the search engine might mark the pages as spam. This file is placed in the root folder of the website and provides basic info on the pages which the bots should crawl and then index in the search engine’s database. If you haven’t set up a robots.txt file on your website, you should immediately add it to your website to make it more search engine friendly. You should pay special attention while allowing or disallowing certain files or folders from your website for search engine index. It is agreed that the search engine bots continue to crawl and index a blog on an hourly basis to achieve the most relevant and updated results. But sometimes it is seen that a few posts under the blog are skipped due to any unwelcome reasons. These posts may be indexed later, but it might take a lot of time. For faster indexing of your site, experts always recommend to prepare a sitemap.xml file, which contains the basic architecture of your site and then submit it to the search engines like Google and Bing by using your webmaster tools account in each one of them independently. For WordPress based websites, XML sitemaps can be generated automatically with this plugin. This plugin is really helpful for those guys who don’t know how to create an XML sitemap file for their website or blog. It is a human tendency to work better in a more planned manner when a particular goal is set. If you set your small goals in the analytics account, and try to achieve them in the set time period, you will realize that success has never been difficult. Different websites can have different goals depending upon the nature of their business and what they are expecting from their websites. For some websites, goal will be ecommernce transaction, for some it will be just form fill up, for others it can be newsletter subscription and for some it can be certain engagement related metrics. In case you don’t know how to set up goals in Google Analytics, check this guide to keep track of specific actions that you want your website visitors taking. It becomes very disappointing as well as irritating for a visitor if he lands up on an “Error 404: Page not found”. These silly mistakes leave a bad impression on the mind of the visitor, and he would not simply just close the page increasing your bounce rate, but also would give priority to any other site over your site. This is the reason that you should start showing 404 error page for all those requests where no page exists on your website. I have seen some website owners adding links for important sections of their website on a 404 page to help website visitors find pages of their interest. Targeting long tail keywords increases your site monthly search visitors. 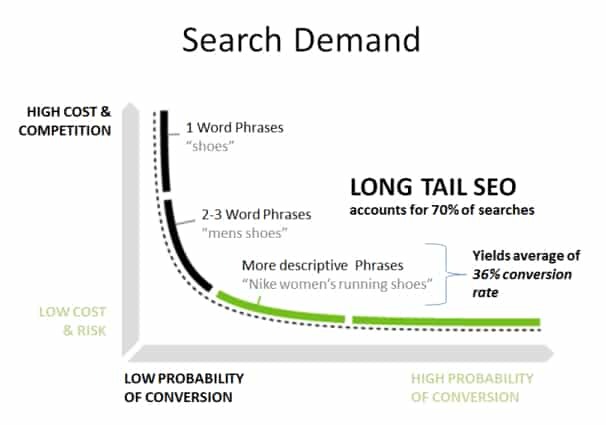 Well, what are long tail keywords? These are the 3 or 4 keywords that are more specific. They get less traffic but have high conversion rate. Use Google keyword planner to find long tail keywords on your seed keyword(keyword that you want to target). Make sure that the keyword you selected is relevant. Apart from Google keyword planner, you can also use tools like SEMrush, KWFinder, Google Auto complete tool, Ubersuggest to find long tail keywords. Once you collect long tail keywords of your niche then start using them in your post. SEO is all about keywords. To get the most out of it, you will always have to thoroughly analyze your keywords, and search for new ones using Google Keyword Tool. You should have some targeted keywords in mind for most of pages that you are publishing on your website. You should use these keywords intelligently within targeted pages like in in the URL, title, meta data, heading section rest of page content. But don’t try to do keyword stuffing. Keywords should be added in a way that they seem to be adding value to the contents of your website. Periodic Check for Broken Links: There are several free plugins and tools in the market which would analyze your site, and provide you with a list of all the links which are broken and need to be fixed. These tools are quick, and provide a simple environment for fast repairs. If you are using WordPress CMS on your website, you should check this plugin for finding and fixing all broken links on your website. Website Speed: If you have used too many HD images on your site, it is bound to get slow. This in turn would affect your SEO. This is the reason you must keep a check at this point too. There could be many more reasons which are making your website loading speed slow. For better rankings on major search engines including Google, your website should load within 2 seconds. If your WordPress based blog is taking too much of time in loading, you should check this ultimate guide. Mobile Friendly site: Your site needs to be tested well to ensure that it is supported by different web browsers running on different platforms like smartphone, tablet, or PC. Mobile friendly website is a must keeping in mind the huge growth in Internet users that have started using their smartphones and tables for browsing the websites of their interest in the recent times. And this trend is going to be more stronger in the coming days. Link building has always been a weapon of construction in SEO. A website with good number of backlinks arise a trust factor in the eyes of the search engine thus helping you to gain high rankings. So to gain better rankings for your website, start spending some time in these link building practices. #1. Creating links from Infographics: The good content always gains links by itself. So, infographics depend on the success of the content’s creation. To experience amazing results, your infographic should reach to your potential audience. How you can reach to wider audience and get links? Social media advertising: You can try Facebook ads or StumbleUpon Ads. Don’t keep more expectations. It tends to bounce quickly but conversion rate is less. But it helps to some extent so why to lose this chance of getting links. Submit to relevant sites: If you use sites like Reddit and StumbleUpon in a proper way, then you can get some links from here. Just observe how you tag posts on StumbleUpon and in what subReddits you are submitting your content. Twitter: You can’t imagine how many relationships you can build using Twitter. Find most influenced accounts on Twitter related to your niche. Follow them and promote their stuff (Re-tweet). They will recognise and retweet your stuff too which will help a lot not only in gaining traffic but also in getting links. Do manual outreach. It takes good amount of time but it’s all worth. Once you have the list of the sites that accept guest posts, check their guest post submission guidelines and what type of content works for them. So that you can tailor your post according to their audience. Write an awesome headline, outline your content and produce killer stuff. Add 2 to 3 additional links to your brand-relevant pages outside your domain. Don’t keep unnecessary links as the real purpose of link in guest post is to support the content you have written for them. 3. Using blogger outreach technique to build links: Google loves those sites that has credibility which means to how many authority sites your site is linked to. If you want only quality sites linked to your site then start using blogger outreach. Here are some of the blogger outreach techniques that will help you to build quality links. Find bloggers’ email addresses. You can use Email hunter tool to find their email addresses. Email is the fastest way to reach out to bloggers. Follow writers and bloggers on Twitter and start interacting with them. Build relationships with them and they will sure include your link in their posts. Check who has tweeted your content. Reach out to them and thank them for sharing. If you find any broken link on other sites, then reach out to that blog owner and suggest one of your similar posts to replace it with. Some will be so grateful as you are helping them in finding errors and fixing it. So, there is good amount of chance that they will the replace the broken link with your suggested link. To find posts that have lot of links, you can use tools like SEMrush. So that you can create much better piece of content. Out of all the above mentioned techniques, the following are most important while using this SEO checklist for new sites in 2019. SEO Friendly Titles: Use title tags to every post and it should be unique. The title needs to be compact, descriptive, and attention seeking. Try to restrict your title within 60-65 characters. SEO Friendly Description: Provide a brief meta description for every page. Meta description should be relevant to the page and try to limit it within 160 characters. Use Heading Tags: You should use heading tags in your content to highlight important points. You can think of including the targeted keyword for a page once in your h1 tag. SEO Friendly URL Structure: Ensure that the Page URL has been optimized for better results. Always use something like http://example.com//seo/seo-strategies-for-newbies.html instead of http://example.com//webdirectory/folder/ht349post.html. SEO Optimized Images: Optimize your images by using Alt tags to make them eligible for better rankings in major search engines including Google. How Your Website Loading Time Affects Your Rankings on Google Search? How to do SEO for Law Firms and Lawyers? I always use the 10 point SEO checklist on all the new websites I run to improve their search rankings quickly. That’s the reason why I decided to write a detailed SEO checklist post to help you boost your SEO. Are you maintaining any such SEO checklist that you use to run through before or just after making your website live? Please share your thoughts and ideas etc around SEO checklist in the comments section. In case you have any questions for me, do let me know in the comments. Yandex and Pinterest web master installation is also a good idea. Nice point of seo here. Quite a comprehensive SEO checklist I must say. Loved your tips about optimizing for SEO. For the most part, Yoast plugin does a good job in maintaining a perfect WordPress SEO profile. The only things we need to look are getting backlinks. Glad you mentioned that point. I am yet to try Google analytics’ events and would love if you could write a post about how you use it or how we bloggers can use it for more conversions practically. Thank you so much for a wonderful article. I have a lot many questions in mind related to SEO and WordPress. I may contact you soon. It’s very essential to follow this list to have a successful blog. Thank you for the list! I love the SEO Checklist! I do love the way you have set it up with the various steps. A lot of people forget the importance of fast website and google analytics. Thanks for proving such useful article! Great Stuff for Newbies and New Websites. Well, Connecting the website URL from all social profiles can give easy visibility to the new website and furthermore get some precious dofollow links – especially on passages like Google+. You can refine your blog post anytime and anyhow you want, but don’t change the permalink as that will become a 404 error to the visitors that will visit it with the previous link. Try to always do keyword research before writing post in future.